It’s been five years since Flora Dane was rescued from 472 days in captivity. Kidnapped while on Spring Break in Florida, Flora endured things so horrific, that she told her story once, and never spoke of it again. But Flora’s reentry to life isn’t quite what anyone expected. Flora throws herself into self defense classes, learning and mastering survival and criminal behavior, and is obsessed with the cases of other girls who have disappeared. It isn’t until the Boston P.D arrive on a crime scene to find a man dead, and Flora, naked, bound and responsible for his death—as well as admitting to tangling with three other suspects since her return, that they begin to wonder— Is Flora a victim or a vigilante? But when Flora disappears again, Detective D.D. Warren discovers that there is a far more sinister predator out there, and this one is determined that Flora Dane will never return home. How do you say that this book was totally awesome and ruined my life at the same time? haha. As a mother, reading about a kidnapping and the horrible things that the kidnappee must endure was reading about my worst nightmare. Ugh. As a reader, this was absolutely thrilling and gripping. I set rules for myself to put down my book, no matter how good, at midnight. 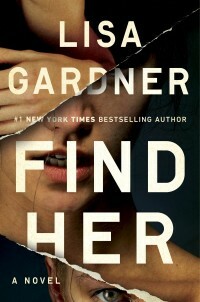 But I could not pull myself away from “Find Her”. Each chapter ended with something so enticing that I couldn’t stop until the wee hours of the morning. The chapters alternated between Flora’s present, Flora’s past, and Detective D.D.’s POV on handling the case and clues. Even though I found some of Gardner’s descriptions to be a little unnecessary (like certain fixations on one characters appearance) the details she used to create the moments that shaped Flora made this story wholly engaging and provided an awesome consuming reading experience. I love Flora. She’s a survivor. And getting into her mind while she worked out her captivity was fascinating. I loved that even though the predator that captured her was sinister, this time, Flora was more sinister too. There is a lot going on in this book. We have so many things we need to understand and see as we work through the crime and discover the players, but I wish that more time could have been spent on Flora’s present captivity. I would have liked to understand more about it. Even still, I thoroughly enjoyed this one and am highly recommending it. I recently became aware that there are more books in the Detective D.D series. This one read completely well as a stand alone, and I didn't feel like I was in the dark about anything having not read the other books.